Consider reading this entertaining commentary, from the Free Lance Star. 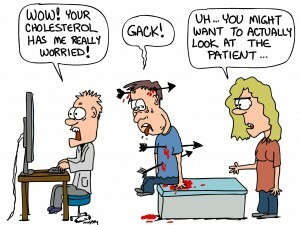 The cartoon was drawn by Dr. Steven Mussey. This entry was posted in Medical Definition, Uncategorized and tagged Assume the Physician, Catch-22, Dr. Blow, Eddie Marcus, Eddie Marcus MD, House of God, John F. Hunt, John Hunt, MD, Sheep's Pen. Bookmark the permalink.